Rancho Cucamonga, CA – November 15, 2018 – Progressive Real Estate Partners, the leading Inland Empire retail real estate brokerage firm, announced today the sale of four parcels of prime commercial land totaling 15 +/- acres in Hesperia, California for $4.3M. The City of Hesperia is the gateway to the High Desert region which is one of the fastest growing areas of Southern California’s Inland Empire market. • Ranchero Crossings – 15 Freeway and Ranchero Road, Hesperia, CA – Three pads totaling 4.6 acres at Ranchero Crossings were sold to private party investors for a combined total of $3M. The parcels are adjacent to the 15 Freeway and the new Ranchero Road off-ramp/overpass that opened in 2015. In addition to the outstanding freeway visibility, significant infrastructure improvements have been completed making the land even more desirable. Starbucks, 76/Circle K and Chevron are already open or under construction at the location. Progressive Real Estate Partners is also currently marketing an additional 39 acres at Ranchero Crossings which is well suited to accommodate fast food, multi-tenant retail, entertainment, hotel or medical users. 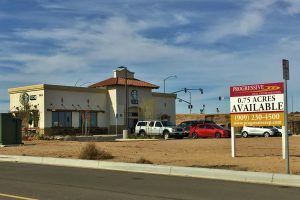 • Ranchero Road and Tamarisk in Hesperia, CA – Primaco, Inc. based in Huntington Beach, California purchased the 9.6 acre parcel for $1,275,000 in an all cash transaction. The location is one of the only remaining parcels zoned for commercial use with excellent frontage along Ranchero Road, which is in the process of being improved into a 5-lane road and becoming a major east-west transportation corridor. Progressive Real Estate Partners (PREP) is a boutique commercial brokerage firm headquartered in Rancho Cucamonga, California. Founded in 2008, the firm specializes in the leasing and sale of retail properties in Southern California’s Inland Empire. The firm is also the exclusive Inland Empire representative of the Retail Brokers Network (RBN). Since the firm’s inception Progressive has completed over 750 lease and sales transactions in over 35 cities throughout the region. Progressive uses the latest marketing and brokerage techniques to help retailers and property owners achieve their real estate goals. The firm is led by Brad Umansky, founder and president.